I'm a big believer in seizing the day, and that includes not saving things for best. I use the posh cutlery set we got for our wedding every single day and my expensive jewellery gets worn around the house. Some people might think I'm being lavish, but the way I see it is, there is no point keeping beautiful things in boxes, they should be enjoyed and loved every day! I feel the same about fashion, although there's no doubting I'm a super casual chick, I love mixing luxurious textures and fabrics with things like denim and leather. 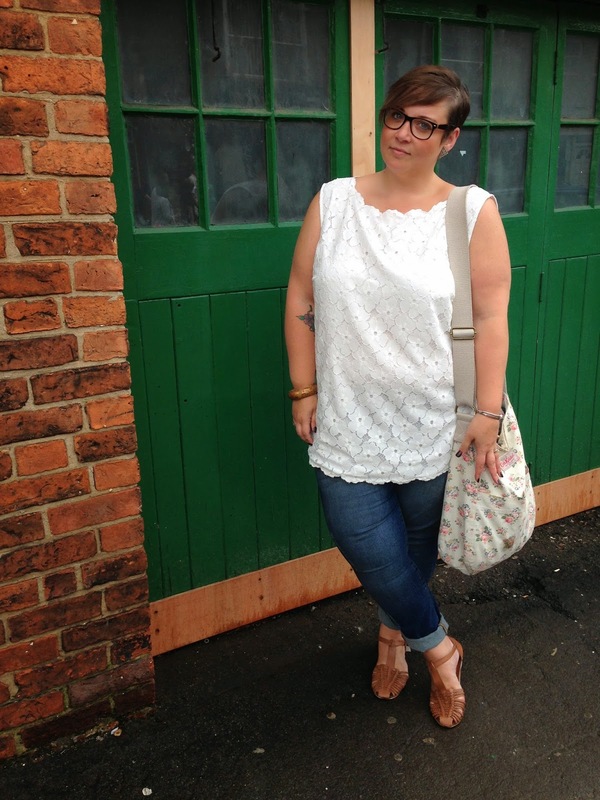 I was lucky enough to be able pick something from the spring/summer Plus Size collection at Elvi, those of you familiar with the brand will know that a lot of it is quite dressy, and is made up of occasion wear pieces. And although they do have some casual pieces, I was drawn to this rather posh lace camisole top. I ordered a 24 because according to the size chart I'm a 26, so I went for somewhere in between. It turns out I would have been absolutely fine with my own size 22. So sometimes it's worth just going for your own size and disregarding the size chart! The top was a bit loose under the arms but other than that I liked the tunic style of it. The top is fully lined and the lace is beautiful quality. All the edges are bound embroidered so it's very fancy indeed! To the back are buttons the full length of the top which adds a really nice feel to the style. Of course I wore it with jeans, I wanted to find a way to wear this type of garment in a casual way. I was bowled over by the quality and choice at Elvi, it's somewhere I would't have thought to shop at previously, but I've now got my eye on several other pieces! Have you checked them out lately? If anything does take your fancy enter BLOGELVI for a 20% discount! I just had a look I had never heard of them before. This top in mint needs to get in my wardrobe!!! It's lovely!! Very very pretty! I too believe in enjoying the best if you can. Life's too short for couches in plastic covers and the fancy china only coming out for guests! I don't know if I should say, "thank you," or "damn you"! I just spent 300.00 over there, but I got some adorable things. I guess I'll go ahead and say, "thanks!" Oh dear!!! I apologise!! Amazing shopping skills though, I'm very proud of you!! I couldn't find a place to enter your code, so I emailed them AFTER placing and paying for the order, and they gave me a refund for the 20% anyway. I am totally hooked on this site. Thanks again, doll!